E and I had a nice relaxed morning. Neither of us are in a hurry since we are both ahead of our individual schedules, so we both left the hostel by the 10am checkout time. It really is amazing how easily I can let time go by in a day with no real reason to keep forward momentum. It’s good for me. It was a great visit and time to relax for both of us. I’m sure this won’t be the last time E and I overlap. I’ve missed quite a few family gatherings over the last 14.5 months in which I was only home for 2.5 months, and that’s one of the most difficult parts of being away. 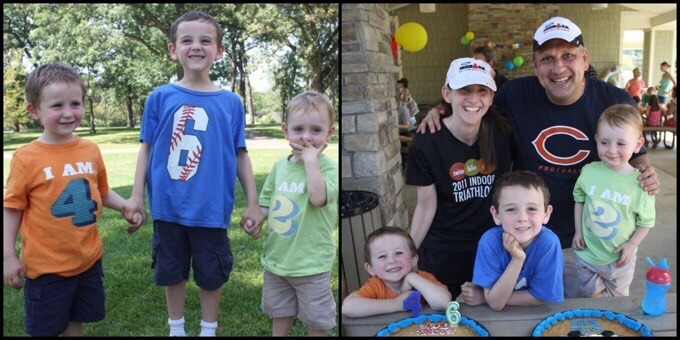 This past weekend, I missed the yearly gathering for my nephews’ (my twin’s kids) birthdays. I’ve gone the last three years and it stings to miss this one. They are getting so big! 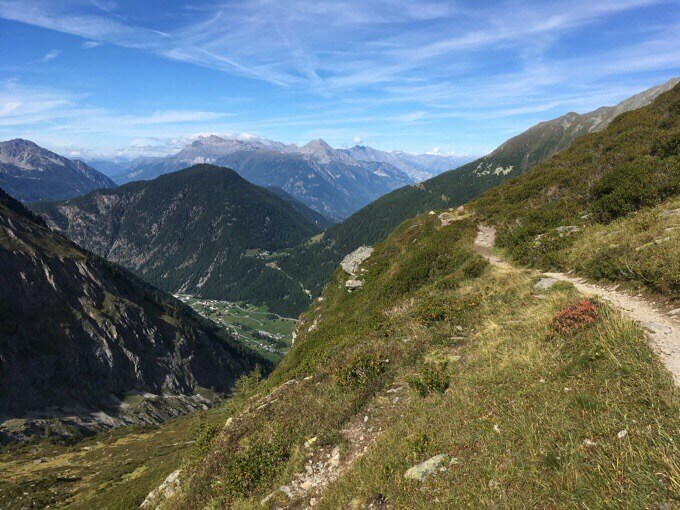 I headed out on my next route, the Walker’s Haute Route that is about 112mi/180km, and goes through the Swiss Alps from Chamonix, France to Zermatt, Switzerland. So, from the two iconic mountains of Mount Blanc and Matterhorn. This is a bonus hike I didn’t expect to have time to add in this visit, but had hoped to fit in. Here’s an overview of the route to have a visual. As always, I now have the route on my Where’s Wired tab, and you can see it in more detail there along with an idea of the elevation involved. You would think that after all these years on hikes, I wouldn’t get nervous, but I was pretty anxious this morning. This is the Swiss Alps! E reassured me that’s it’s very straightforward and just like what I’ve been doing. Inside, I’m always going to be that kid that grew up in Southern Illinois with prairie as my reference to outdoor scenery. It is approaching the shoulder season, so there will probably be some weather, but just like I’ve had along the GR5, there will be plenty of time and opportunities to seek shelter and take time off to let anything pass through. I have ample time, and came here to actually see the mountains, so I’ll wait if necessary. The next few days look good, and I headed out to a clear brisk morning this morning. 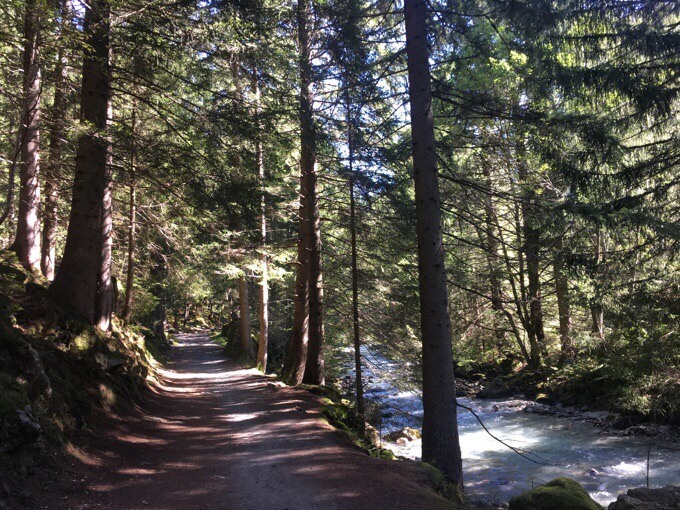 The first couple hours was a wooded walk up valley along the Arce River to the next village of Argentière for lunch. 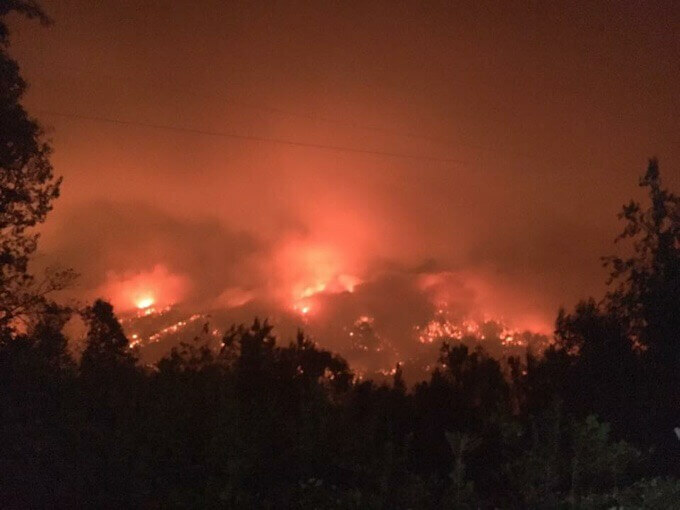 Another major factor to this day is that I saw online before I left that a fire that started a few days ago back home in the Columbia Gorge near Portland, OR has expanded greatly. 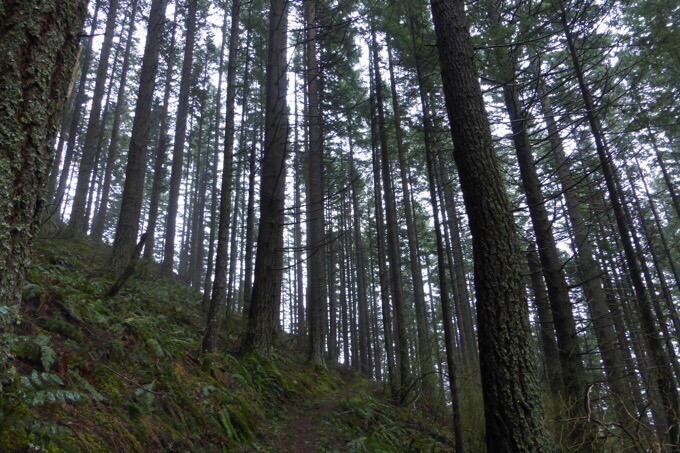 I’ve been aware of the fire that started this weekend on the famed Eagle Creek Trail when teenagers was setting off fireworks along the trail. As I was leaving today, I found out that the fire has spread to a level of complete devastation of an area that means so much to so many that live there. All my friends are posting photos and it’s just devastating and so horrible. I’ve asked to use a couple. 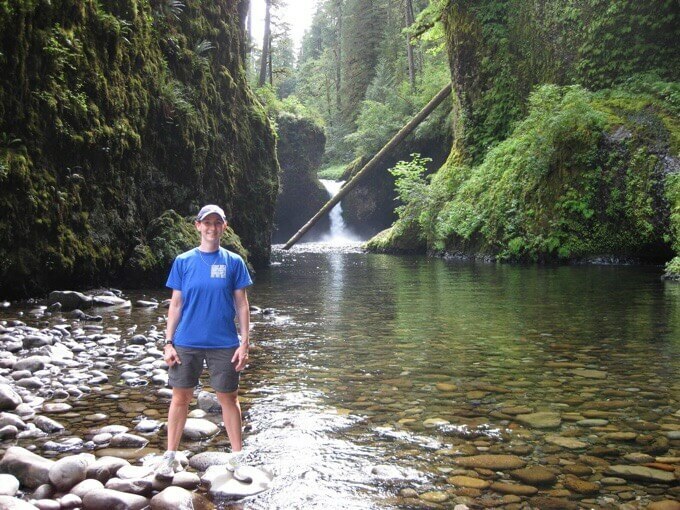 It’s on the Oregon side, where most of the hiking is in the gorge. Looking from Washington at the stretch from Multnomah Falls to Angels Rest. Photo by Carrie Carter. 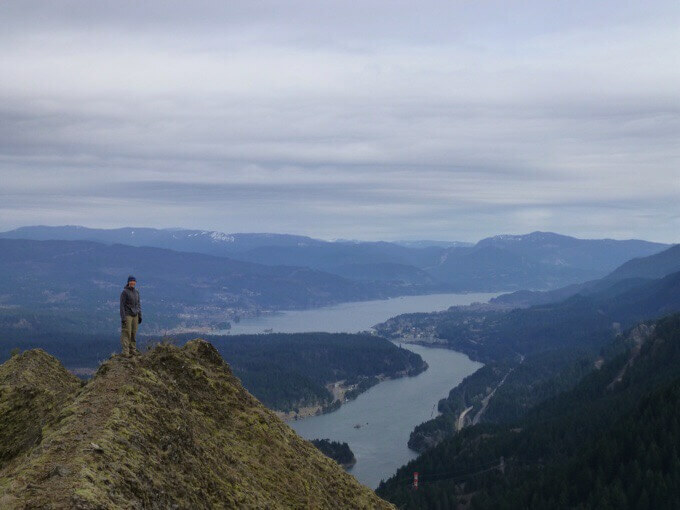 Many of you will best know it from the Pacific Crest Trail as where the Bridge of the Gods spans the Columbia River and connects the states of Oregon and Washington. The area is also known for wind surfing because of the winds that can blow through there. With hot dry weather and wind, the fire has spread insanely fast and obliterated a historic place we all treasure and consider sacred. Bridge of the Gods from the Washington side. Photo by Craig Giffen. The reality of the loss hit me suddenly and hard as I headed into the wooded section of the walk up the valley this morning. It was so reminiscent of the Gorge that I felt like I was there again. It was deeply saddening and feels like I’ve lost a loved one and part of myself. There are so many significant memories and moments when I think of the Gorge. I spent the whole morning on the verge of tears. I don’t think it would have hit me so strongly if I hadn’t been waking in a forest that made me think of the Gorge so much. I’m both surprised and not that it’s affecting me so much. The Gorge is a haven for so many of us and runs so deeply to who we are. It’s not like this will pass through and everything will return to normal. Also, it isn’t just one small section. It’s the whole stretch so far from Bridge of the Gods to Angel’s Rest. It’s gone! 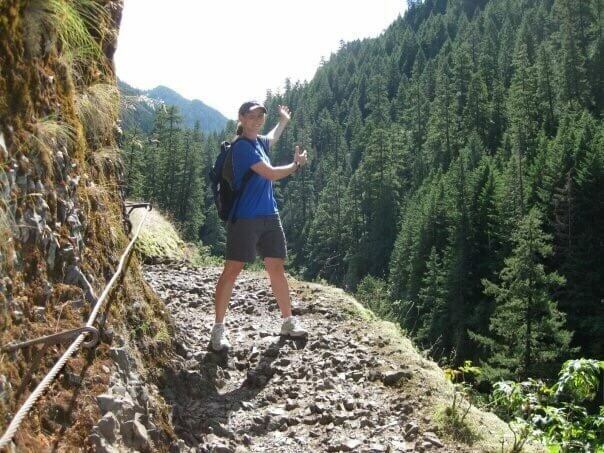 My first hike in the Gorge. Eagle Creek where the fire started. Anyone who’s hiked through a burn section on a long trail knows how hauntingly terrible the results can be. To see the flames so violently ripping through it is heart wrenching. You all know my affinity for the woods, but particularly the Gorge. It was so lush, green, and calming. I could always take the short drive to the Gorge and immediately be transported to another place returning refreshed and calmed. I love the way the trees rose high from the fern covered hillside like columns, so I could still see far into them. The soft pine needled trails with amazing waterfalls and streams in all the little bends. Elowah Falls, my favorite falls in the Gorge. Punch Bowl Falls, on the Eagle Creek Trail, where the fire was started. 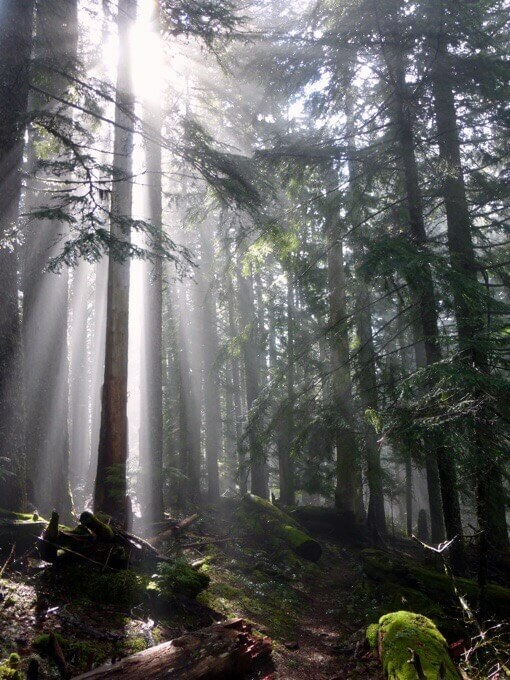 The way the light would shine through the fog like a stage light there to give a spotlight to the moss covered logs or rocks along the trail. Nothing can put into words the heaviness of this loss for so many people. Word is that the fire may have even jumped the river and be burning in Washington as well. Anyone that’s walked through a forest burn knows how terrible and eerie the loss is. There’s nothing like the Columbia Gorge in the world and it’s gone. As I walked through the forest today, I felt like I was being given an opportunity to say goodbye to the Gorge and absorb it one last time. I didn’t want to let go and didn’t want it to end. I walked slowly and took it in while thinking of the years of hiking I had in there. 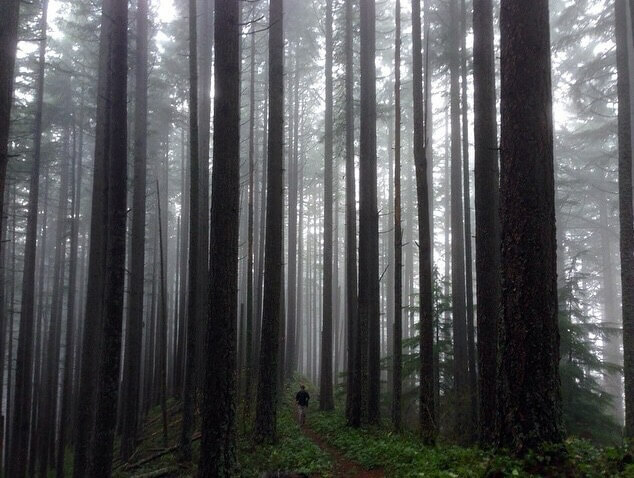 It’s where I honed my hiking skills and has been my training grounds ever since I moved to Portland in 2009. 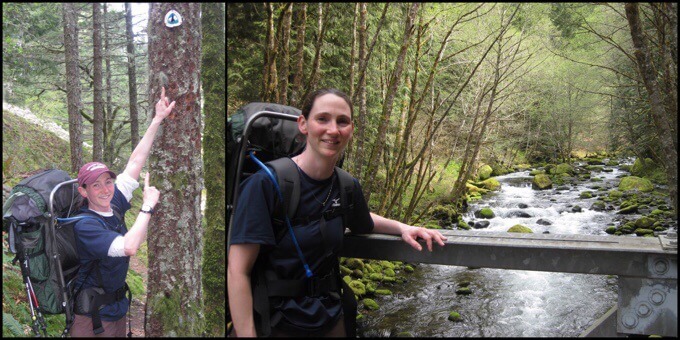 My first overnight trip in the Gorge and PCT blaze sighting. Yes, that’s an external framed pack! It was a kid’s pack. With all this sadness, I wasn’t wanting to eat. 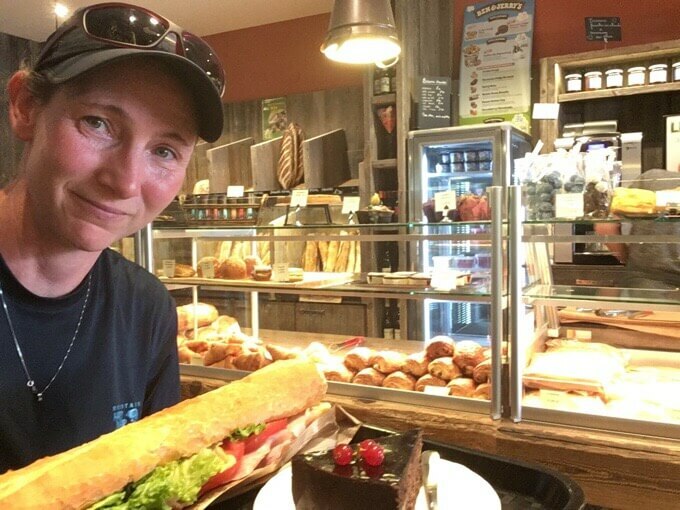 I got to the village of Argentière, and told myself that if I saw something that made me want to eat, I’d do that even though I had a pack full of food because I wasn’t wanting any of it. There was an awesome cafe with sandwiches and desserts that I ended up eating at. It was really good. However, once back in the forest, the sadness returned and had to focus to keep the food down. 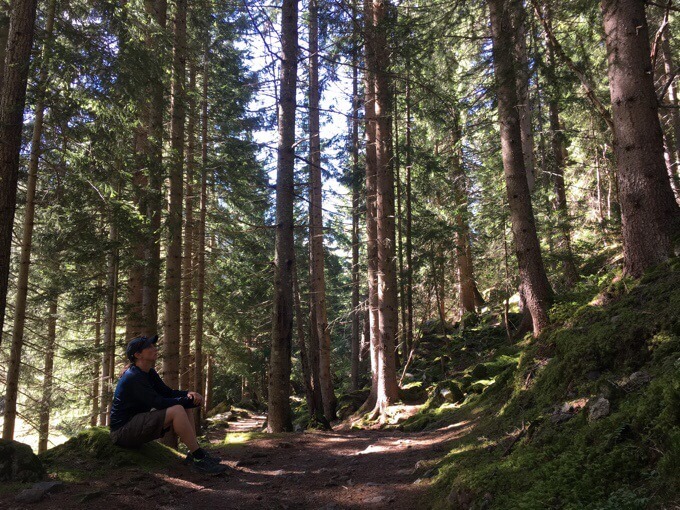 I soon got to the end of the forest and sat in the final shade before the climb up to Col de Balme. Many of my friends are posting their memories from the Gorge on social media, and I decided to go through what I could find of my personal photos from my phone and choose some of my favorites to share. It’s a process I needed to go through. As I was finishing, a couple walked by and one had an Appalachian Trail hat on. We talked for a good 20mins and it really helped me to break out of the sadness and shift to a new frame of mind now out of the woods. 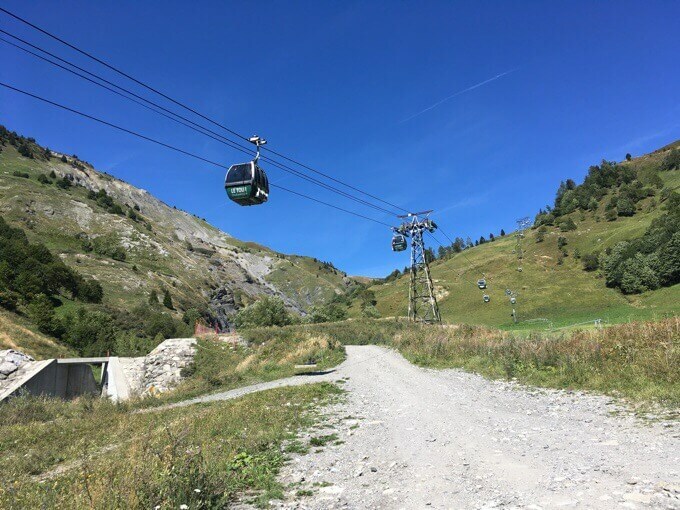 I climbed up the gravel road to Col de Balme as many took gondolas up. 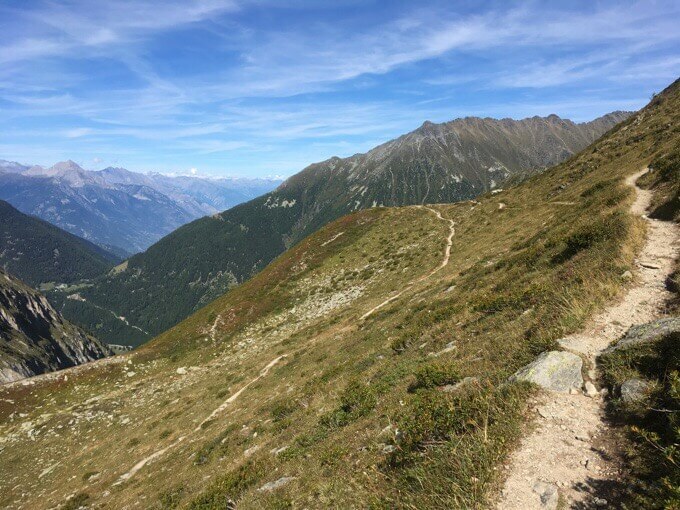 Crossing the Col de Balme, I entered Switzerland for the remainder of the hike. I’m having some technical issues with the SIM I thought I’d have, so I may be limited to wifi for the week or two I’ll be here and posts might be a bit delayed. 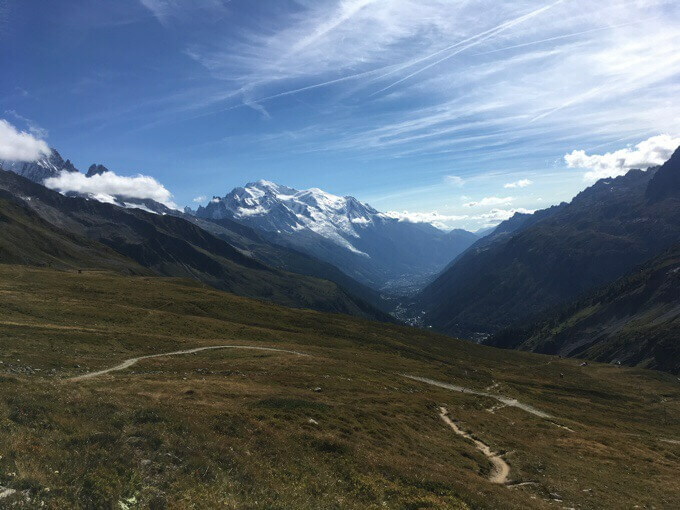 Looking back towards Mt Blanc. From the col, there’s an option to take a variant that stays high rather dropping down to the village of Trient. It was a great option that traversed high and had great views. 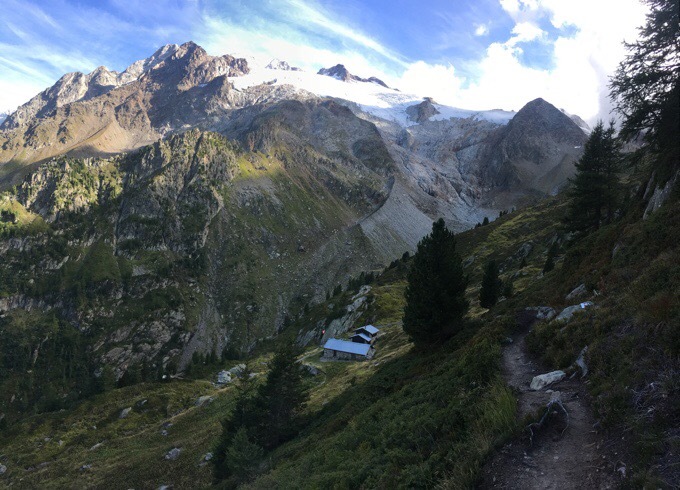 It started to hit me that this Haute Route was really happening. I know tenting in Switzerland is even less popular than in France, but it is doable. 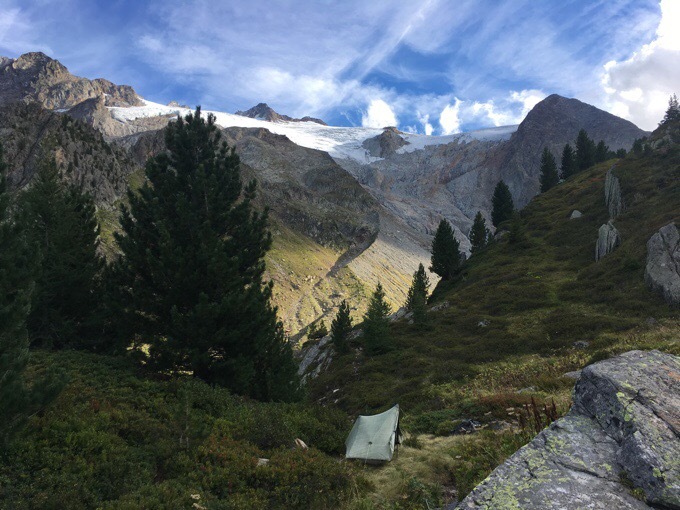 E was able to tent every night along the Haute Route. It’s just that there can be few opportunities, and you need to be aware towards the end of the day to keep an eye out. I figured I’d find something as I approached Refuge Les Grands. 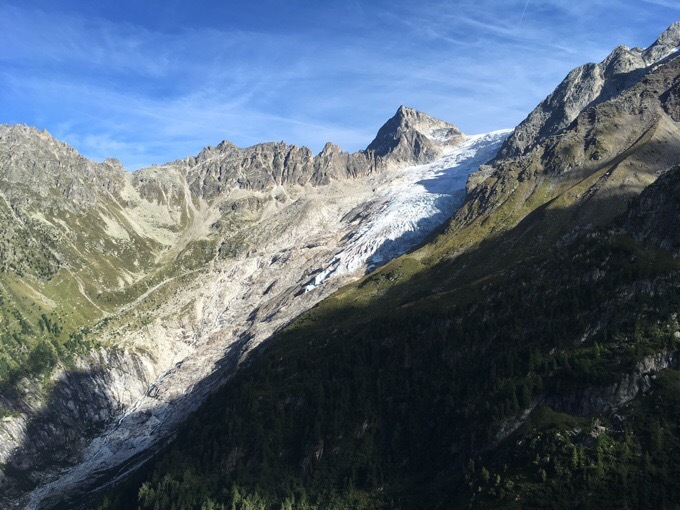 The view turning that corner with Glacier du Trient and Glacier des Grands was…well, grand! This hike doesn’t waste much time getting to the good stuff. Glacier des Grands and refuge. I reached the basic refuge that was manned by one guy, (but I don’t think they provide food options). He said it was 18€/$20 to stay inside or I was welcome to camp for free, yay! I chose a spot down a bit and more protected that’s perfect! It’s a really quiet and peaceful spot, and not cold at all. I’m especially tired after an emotionally draining day, so I’m looking forward to a good night of sleep. See the tent in the middle. O Girl, your story made me cry. I really feel for your (and many other’s) loss. And I realize how much a place and a view can mean to us. This summer I hiked through many Pyrenees landscapes for a second, third and sometimes even seventh time, and I notice how things have often remained the same, how some tracks or now more obvious, how ultra trail has gained popularity (whole routes marked with flags) and luckily also how some places are still abandoned (who dares to hike in Basque Country anyway?) Hiking is so intense: we constantly breathe impressions and are left with beautiful, very diverse memories. 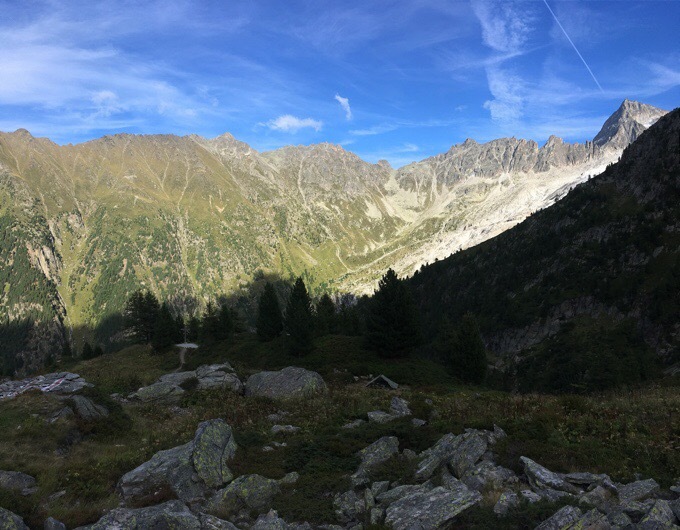 We remember where we jumped into a lake on a hot day, where we took water and were carefully examined by curious butterflies, we remember the views that were a feast for our eyes in the early morning sun,… In a way we hikers need a lot of space, and there isn’t even much left. We mostly hike in mountains, not only because of the dramatic scenery but also and maybe mainly because civilization hasn’t been able to leave many marks there. When then one of our favorite playgrounds is damaged, it’s only natural that we’re hurt personally. I really hope the fire soon goes out and that in a few years’ time young trees will make the Gorge look hopeful again. Thanks for sharing your story, Erin. See you on the trail some day. You get it Tom. It’s such a deep feeling that’s so difficult to describe. I do hope we cross paths someday! So sorry that your trip had to be interrupted by the news of the fire in the gorge. Seems the whole state is on fire – really isn’t but seems that way with fires in South Western Or. as well as Crater Lake and the Sisters area. Many others too that is keeping the firefighters busy. Things look better this morning (except for the smoke) or so the news report said. You are in beautiful country and hope you will/can enjoy yourself. Love the pictures. Thanks for sharing your feelings about Columbia gouge fire. Ours and many others have the same feelings. We are heart broken and almost physically sick. The fire leader said this morning that the damage is less than the pictures indicate. Please let that be true. The gouge isn’t just a pretty forest, it is our church. Exactly! I hope that is true. I had an awesome thru hike of the Gorge planned with a friend when I return in October. I wonder if we might find a way to still do something. This is so sad about the gorge! Just devastating! I haven’t been to the Gorge since I was a little kid, but was planning on going back soon, but now that may be delayed. I also might delay my entire PCT thru-hike because of this, which I was thinking about for 2020. So sad. Hopefully it is better than it looks. Who knows how apocalyptic the PCT will be by then! Oregon is on fire, The worst that I’ve seen in the 20 yrs that I’ve been here. Portland to Eugene had the worst air quality in the world the past few days. The wind from the East blew smoke and ash into the valley. When I saw ash on my car in the morning I thought a volcano exploded overnight and I missed it. Most of the fires in central Oregon started from lightning strikes. I had to cancel my hike around Broken Top/Three Sisters as a new fire popped up the week before. Right now we are praying for rain. 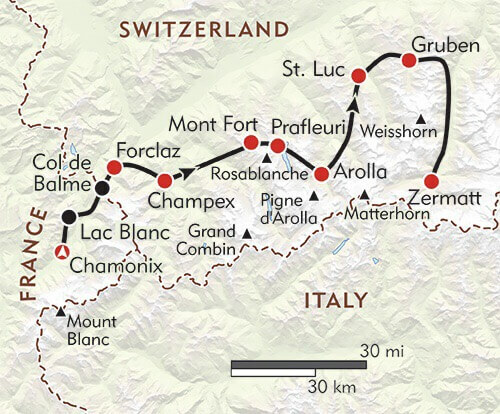 Your routes in France – Switzerland are gorgeous (no pun intended). Thanks for the sharing. Ugh, it’s such a bummer. I missed quite a year in Oregon this past year. I knew from the title exactly why you were mourning. As I commented recently here, my heart went out to you and so many who were losing so much. And that Gorge is so special even to those who just drive through, or like me who got to spend non hiking time there. When you have been to places, they are so much more than a name in a news report. That Gorge is certainly one of those places, along with Key West and the Mississippi Gulf Coast. I have a bracelet from Pass Christian, a place that was destroyed by hurricane. The fires all up and down the West are sad .. but the ones started by stupidly. I think the fire in Riverside county CA was also started by fireworks. I lived in a canyon here in OC (in Cleveland National Forest) for a decade and fire season was strictly enforced. No smoking, even in cars, no barbeques in any location. It did burn after I had moved away. Seems like most of the hikers I follow are having to deal with smoke and fire currently. I know that this hurts your heart and this Illustrates how Important it is that you capture and share these places some of us will never experience. Thanks so much for taking time to include us in your memorial. Perhaps you will do that sad hike later, which will bring home to readers what the aftermath is like. Nature will rebound, in time, but we may not see that. This next route looks very special. I hope it provides a measure of healing. The whole west coast and even Canada is on fire this year. Terrible year for thru hikers. Thank you for honoring our beloved Oregon. This morning, for the first time in weeks, I can see the Cascades. I dread going out to see the devastion to do many favorite trails amd beloved wildenesd. I’m happy to hear I may be returning to clear skies. I still have hopes that the fires didn’t hit as much as first feared! Sorry for the late response, I just got back from 6 week road trip which included 2 weeks on the PCT. I am saddened by the Eagle Creek Fire. I had just been there 2 weeks before it started on the PCT. 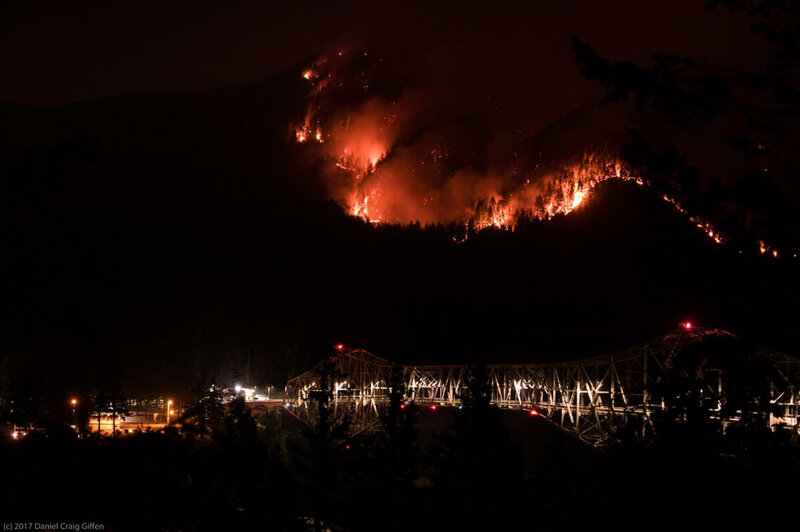 I ache for the people of Cascade Locks that were evacuated. They are some of the kindest people on the trail. I also had to reroute my plan around the Whitewater Fire near Mt. Jefferson. So many fires in OR this year. It will take years to regenerate.